This luxury Villa with a private pool and jacuzzi is located in one of the most prestigious residential areas of the Costa Tropical. Situated in Andalusia in southern Spain, in the Urbanización Costa Aguilera which belongs to the town of Salobreña(Granada). This luxury Villa is just 100 km from the airports of Malaga, Granada and Almeria. Almost all the way is by motorway. 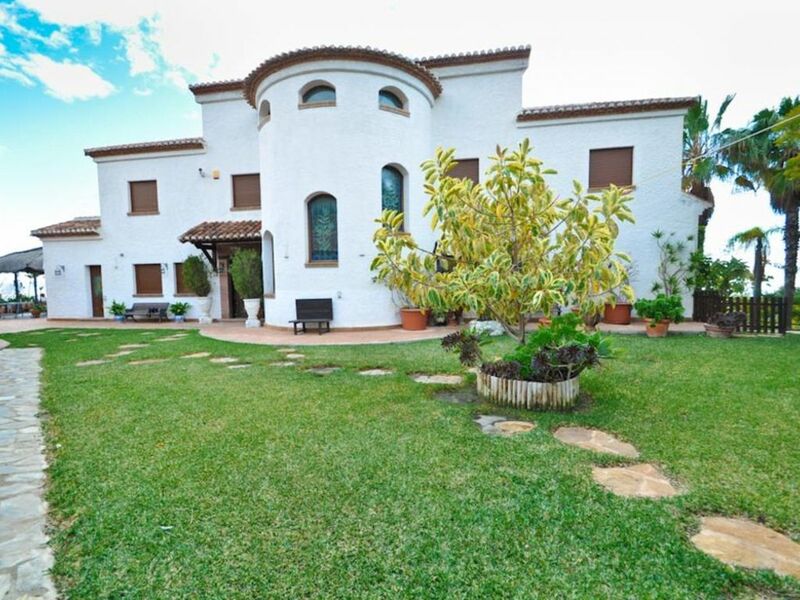 The location and access to this Villa and Urbanización Costa Aguilera is very easy, since they are near the N-340 that connects Malaga to Almeria. Furthemore, it is just 2.5 km and 10.5 km from Salobreña and Almuñécar (Granada ), tourist town par excellence of the Costa Tropical. It has been set on a plot of 5.000 m2 and 500 m2 of housing. Here all is light and comfort. It is designed for relax. It has been built with materials and finishes of extraordinary quality. Facing south, it provides us with sunshine and light throughout the day. It has large windows allowing excellent views to the entire region. It has managed to combine classic materials with artisans (rustic) . The many details are proof of this. The orientation provides us with unique views of La Caleta, La Guardia, Salobreña with its rock into the sea and the Moorish Castle built on top of the village, Playa Granada (with its golf course with 18 holes), Motril with its harbor and Yacht Club, the Mediterranean Sea and the lighthouse Faro Sacratif. Villa La Raijana has been built on three floors plus several isolated units and parking for several cars,. It has 6 in-suite bedrooms, 6 bathrooms. A large living room and a lounge with chimney, all located in two different levels, extensive independent kitchen, several terraces spread over the plot, laundry, barbecue with bar, dress and a pool area. This villa for rent has an extraordinary wine cellar, garden and excellent swimming pool with Jacuzzi. The cellar is reached by a ladder that is in the kitchen. It is built with rustic materials that was placed by hand. It is a large space with big tables. The wines are outstanding, also has a toilet that guarantee your comfort. TOPACIO, en-suite bedroom: It has 2 single beds, large closet, bathroom with sink, toilet, bidet and shower. Stunning garden and Sea views. AMBAR, en-suite bedroom with 2 single beds, a large closet, bathroom with sink, toilet, bidet and shower and a beautiful terrace with stunning sea views. TURQUESA en-suite bedroom with twin beds, bathroom with bidet, sink, shower and a terrace with stunning Mediterranean views. ESMERALDA, en-suite bedroom: has a double bed, large closet, bathroom with sink, toilet, bidet and shower. The staff at Villa La Raijana was amazing and the reason for the high rating on this review. Carlos, the rental manager, spoke excellent English. He was so helpful and immediately available when there were problems. We arrived after 1am in the morning, and he was there to greet us with groceries and kind words. He had the whole house lit up, and we felt so welcome. When the water gave out our second night there, Carlos immediately called a repair man and the problem was solved in less than three hours. He also gave us good travel and touring tips. Paco, the caretaker helped us figure out the washing machine and showed us how to use the beer tap in the outdoor kitchen. Maria and Francisco cooked us absolutely amazing meals every evening, Monday through Thursday. I would strongly recommend using them. They cooked us quintessential Spanish cuisine that belonged in any highly priced , highly rated restaurant anywhere in Spain. Every meal had a starter, a main course and a dessert and everything was fresh and hot. The house itself was beautiful inside and out and very clean. The infinity pool was a perfect temperature and the views of the Mediterranean were amazing. Some of the palm trees have grown bigger since the pictures were taken, though, and blocked a little of the view. The formal gardens were incredible and the numerous balconies and sitting areas were very well positioned. We used every single terrace and table in the gardens. The house had so many gorgeous decorative details and the fact that every room had its own bathroom was wonderful. The one missing star is for the following aspects. The house is older and has seen wear and tear. There were issues with ants, though the staff was actively trying to eliminate them. The beds were hard and small - double and twin size. The systems were stressed by our group of 14 people. The water stopped working and the outside lights were on a timer that was inconsistent. The AC in the kitchen didn't work, and we needed it since it was the only location in the entire house with a modern TV that had an HDMI connection. The large TV would have been better positioned up in the game area at the top of the house or a large TV should be purchased for that space. The WiFi was stressed by 14 people with multiple devices. The price was appropriate for the mixture of beauty and quirky mechanics of the house. I would highly recommend the rental. Eine tolle Villa mit allem, was das Herz begehrt!! Die Villa ist ein ideales Haus für Gruppen bis zu 12 Personen. Alle Schlafräume sind ungefähr gleichwertig, haben gute Matratzen, gute Badezimmer und fast alle Mehrblick - die meisten sogar einen Balkon. Die Außenanlagen sind einfach nur toll - ein großer Gasgrill, eine Zapfanlage und überall runde Tische, die für die Kommunikation einfach genial sind. Der Pool hat uns supergut gefallen und der Wasserfall ist einfach ein Hit, der für eine ganz tolle Stimmung sorgt. Das ganze Geländer - man muss eigentlich schon Anwesen sagen - ist sehr gepflegt und weitläufig. Wir kommen bestimmt wieder!!! Ein ganz großes Dankeschön auch an den Verwalter Carlos und seine Familie, die sich zusammen mit Paco um all unsere Wünsche gekümmert haben. Das findet man nicht oft!!! Klasse! Wir waren eine Gruppe von 13 Studenten, welche den Bachelorabschluss in dieser Villa in Spanien gefeiert haben. Die Betreuung durch Carlos (Verwalter) und dem Gärtner/Poolboy Carlos waren genial. Bei Fragen oder Problemen, ein Telefon, und das Problem wurde gelöst. Die Begrüssung war genial, die 20 Liter Bier, welche in der Vermietung inklusive waren, waren bereits angezapft. Die Gläser waren kühl gestellt, also Prost! Die Villa selber ist komplett ausgestattet, von der Küche über die Bar, einfach genial. Wir haben die Zeit in Spanien sehr genossen, wir haben viel Zeit am Pool verbracht und haben auch sehr viel gekocht. Einfach zu empfehlen! After more than 40 years of going gradually developed due to the efforts of their owners, from more than 20 countries, Costa Aguilera is now a beautiful, beautiful residential development, which in no way resembles other built along and width Spain, with virtually identical houses in an environment of cement. The gardens and parkland, with its shrubs and trees, have transformed what was once a barren hill in a green oasis, where permanently the chirping of birds and other animals such as squirrel red tail, listening have established their nests and have adopted it as habitat. Because of its location at the foot of Sierra Nevada, along the Mediterranean and in front of Salobreña, one of the most beautiful villages crowned with a beautiful Moorish castle, the owners of Monte de los Almendros, enjoy views of beauty and colorful indescribable (white Sierra, sea blue, green Vega). Golf: The Los Moriscos golf course is open to the public and is located next to the beach of Motril on the Costa Tropical. It is ideally located in the heart of the Costa de Granada, only 5 minutes from Salobreña and 10 minutes from Almuñécar. This is a type links located about 8 km from Motril, a sports complex near the beach area. The Moriscos, with 2. Travel 850 meters, has a flat surface decorated with slender palm trees and sugar cane. Generous greens and wide lakes pervade this Grenadian field. The course has 18 holes spread over 5072 m. The shortest hole is 130 m 5th and the 15th longest at 492 m. The field is usually quite flat but there are many artificial barriers such as lakes and bunkers. The ski resort and Sierra Nevada Mountain is the southernmost of the European stations as it is in Andalusia, and is the highest mountain system in the peninsula. 2. It has 500 hectares of skiable area with a total of 62 kilometers, divided into 45 tracks of different levels, as well as off-piste itineraries. Sierra Nevada is the season of Europe with more days of sunshine per year, with a great quality of snow throughout the season. It has a magnificent hotel infrastructure that expands in Granada, thanks to the excellent road access only 32 kilometers, is one step away from the station.